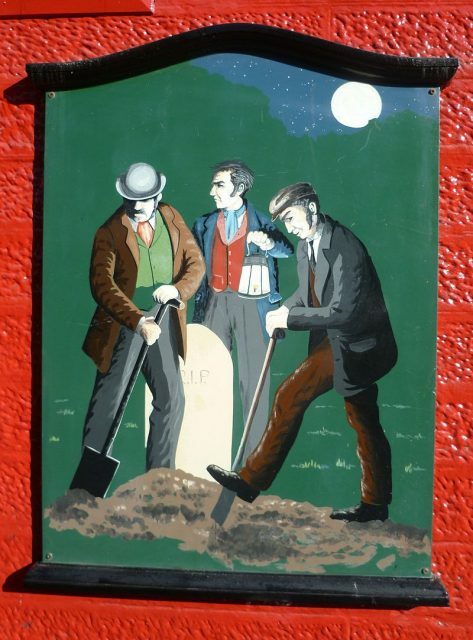 During the late-18th and 19th centuries, grave robbing became big business across Great Britain and the U.S. The fact that certain medical schools would pay for fresh corpses only fueled the practice. 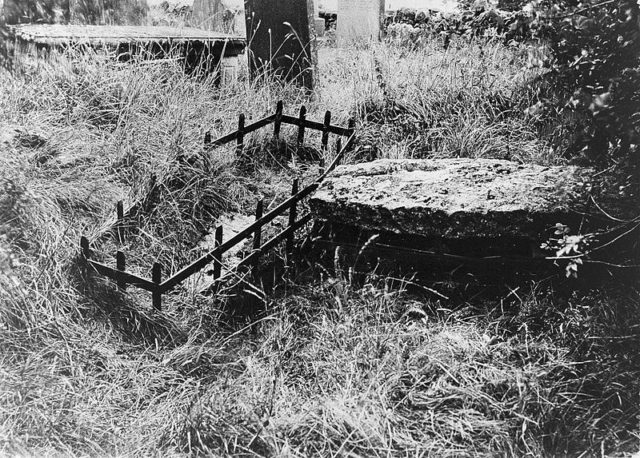 People used many ways in which to protect their dead. In order to protect the body before burial, friends would be assigned to work in shifts sitting in the same room as the corpse so as not to leave it alone. 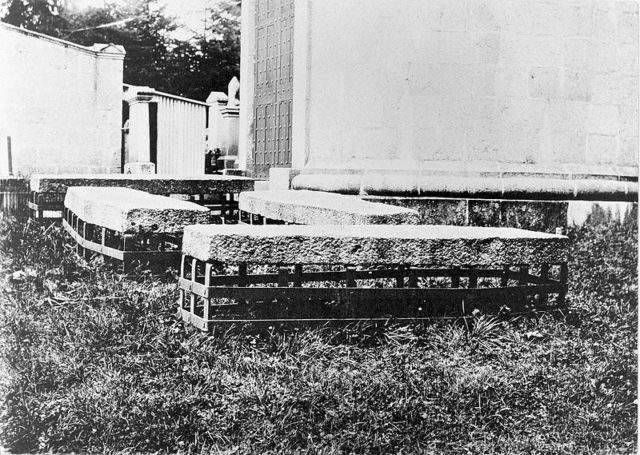 After burial, the families would hire or organize a group to watch cemeteries at night or, if financially able, would use a mortsafe to protect the grave. 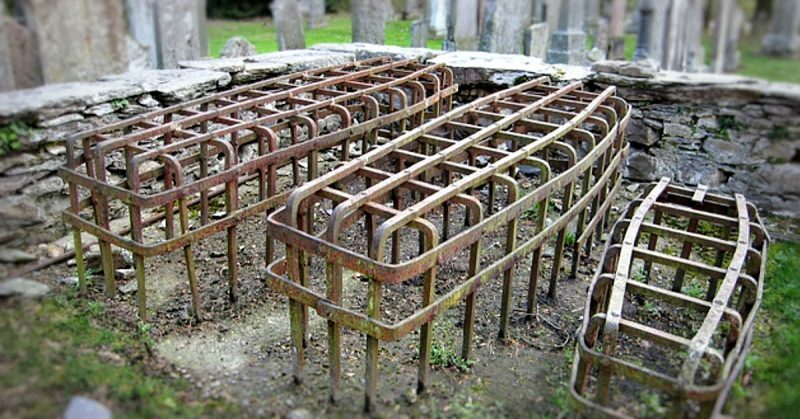 This was a cage made of iron that covered the grave until the body was decomposed enough to no longer be valuable to medical schools. 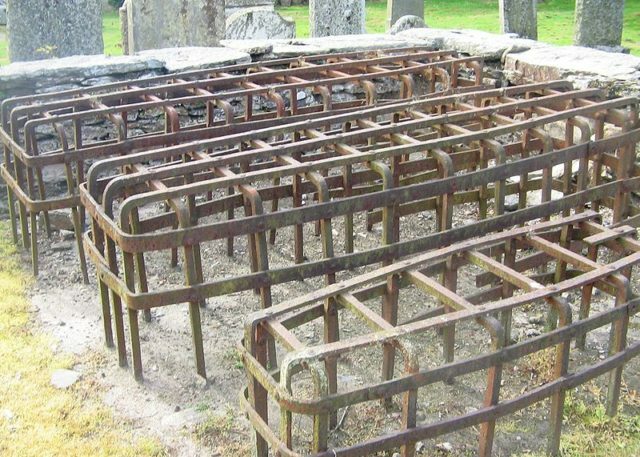 Many communities shared the cost and passed around a mortsafe or rented one from the church. Most were assembled at the grave because of the excessive weight. 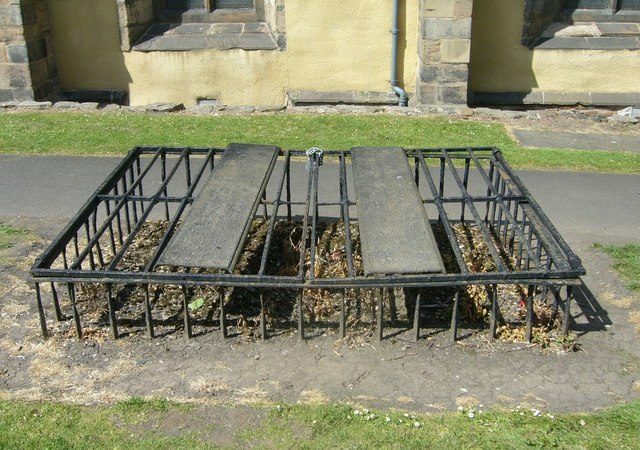 In Scotland, the problem of grave robbing was stepped up when the most unscrupulous turned to murder rather than having to dig up a body. In 1828 two Irish men who had separately settled in Edinburgh, William Burke and his accomplice William Hare, committed a series of murders in order to to provide a fresh supply of cadavers to Dr. Robert Knox, an anatomy teacher of the medical school at Edinburgh University. Burke and Hare’s first delivery was an elderly man who lived in the building owned by Hare and had died of natural causes. They received seven pounds and ten shillings from Dr. Knox. With the ease by which they had earned this much money, the two kept on the lookout for terminally ill people. Soon the shortage of ill people caused Burke and Hare to lure prostitutes and the poor elderly to the lodging house to kill them by suffocation. When they delivered the bodies to Dr. Knox, he never questioned where they were acquired. 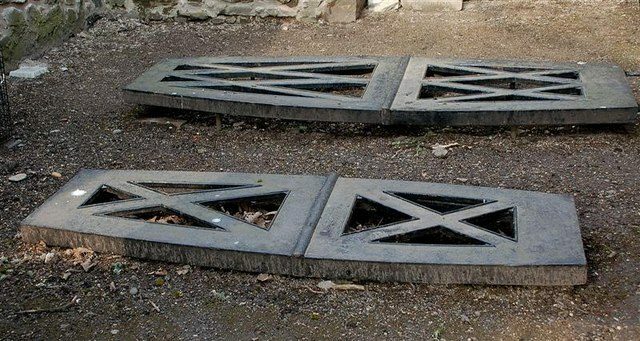 According to The History of Burke and Hare and of the Resurrectionist Times by George MacGregor, Edinburgh University was no stranger to body snatching, with students and even nurses turning in bodies for money. 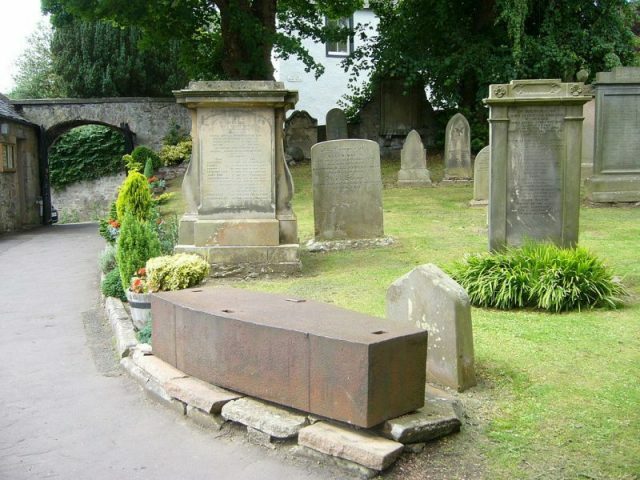 In December of 1827, Hare met Mrs. Smith, an elderly woman who had just arrived in Edinburgh. She had been drinking and Hare befriended, her insisting that she lodge with him. At Hare’s home more and more alcohol was served and Mrs. Simpson became so intoxicated she could not leave. The next morning she was so hungover that Hare gave her more whiskey to help her feel better. It was then that Hare put his hand over her nose and mouth and Burke held her down until she suffocated. 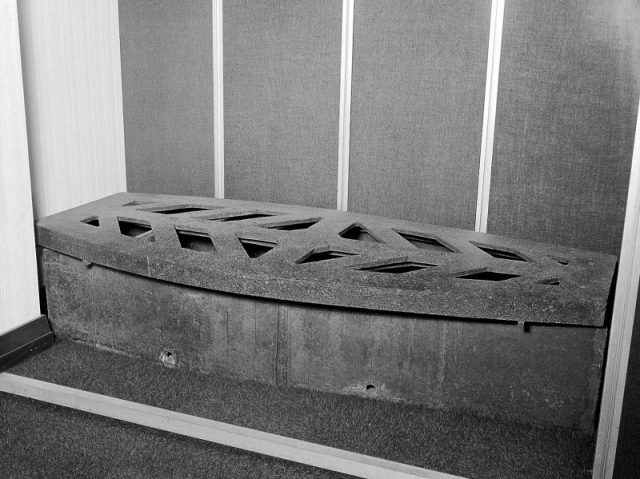 They placed the body in a box and took it to Dr. Knox, receiving about ten pounds. The murders continued with Hare and Burke getting their prey drunk and then suffocating them — until they attacked James Wilson, called “Daft Jamie” by the townsfolk. He was a mentally challenged young man known by almost everyone. Jamie was a gentleman who was a wizard with numbers and harmed no one. In the fall of 1828, Jamie was wandering about town looking for his mother when he came across Hare’s wife, Margaret. She lured him to Hare, who got him drunk while Mrs. Hare went to get Burke. Once they were all together even more alcohol was consumed. When Jamie passed out, Margaret left and Burke and Hare attempted to suffocate him. The men were accustomed to killing women and old men, but Jamie fought back. After a fierce struggle, the two men finally overpowered Jamie and smothered him. However, when he was laid out on Dr. Knox’s table, some students recognized him. In town, Jamie was missed and suspicion was raised. It was only after visitors to Burke’s house found the body of the next and final victim, Mrs. Marjorie Docherty, that the group was arrested. Hare was offered freedom if he testified against Burk, and after a long and highly publicized trial, he and Margaret were released. Dr. Knox was acquitted but was shunned by society and moved to London. Burke was hanged and publicly dissected. His skeleton, death mask, and a book cover made from his skin now reside at the Surgeons’ Hall Museum in Edinburgh.